I’ve just been diagnosed with non coeliac gluten intolerance. My levels of intolerance are quite high but these really do work, it’s been fab being able to enjoy gluten again. Do you wish you could eat gluten rich foods again like bread, pasta, pizza, cakes and biscuits but just cannot face the unpleasant effects of gluten sensitivity? Well, you can again thanks to a revolutionary new food supplement called EatEnjoy Gluten. Enjoy milk, cheese, ice cream and butter again. Wouldn’t it be great to eat dairy without worrying? Now, thanks to EatEnjoy Dairy, you can eat the foods you enjoy including milk, cheese, ice cream, desserts, cream, butter and much more! A UK-based company supplying innovative food supplements and nutritional products designed to help people live life to the full. Pharmavita is a UK-based business which searches the world for exciting and innovative food supplements and nutritional products designed to help people live life to the full. All products are made under Good Manufacturing Practice standards. 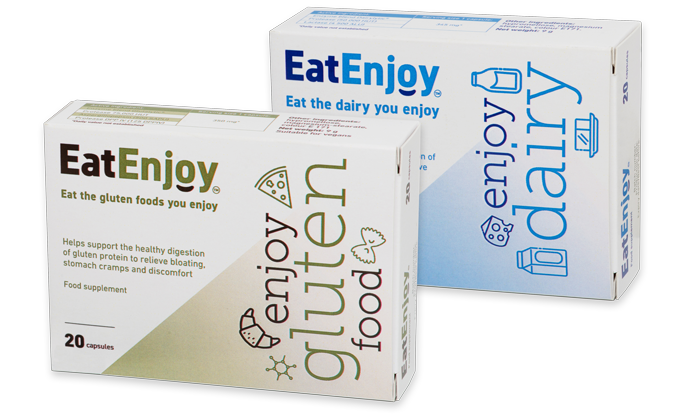 EatEnjoy Gluten was developed under the name Glutalytic by world-renowned scientists at the US enzyme-supplement specialist Deerland Enzymes. EatEnjoy has been exclusively developed with Pharmavita as a product specifically designed for European markets.